Well it surely has been a while, but that does not mean I haven't been sewing! One of my favorite things to do is to sew something QUICK! And one way to do that is to re-vamp a T-shirt. I'm not sure if I like that word, re-vamp. I think I like "transform" better. Here is a T-shirt transformed into a halter dress. The T-shirt was a size Small, so okay, the waist is a bit snug, but I don't think it's too snug. I wore a halter dress when I was a little girl, and I never thought I would ever wear one again. 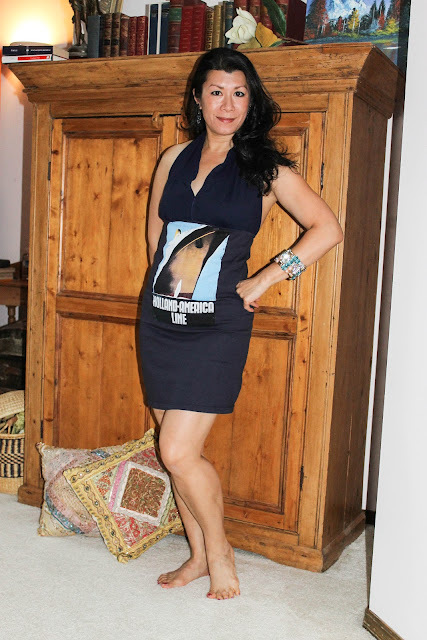 But here I am, 50 yrs old, wearing not just a halter dress, but a mini halter dress. With the cruise ship graphic, it so invokes the feel of a relaxing vacation. The bust/straps which I drafted myself are cut from navy ITY jersey, lined, with swimsuit cups so a bra is built in. My next project to show you is a dress from HotPattern's Riviera Côte d'Azur Knit Dress pattern. I used the tunic version, just lengthened a bit. I also added an ungathered ruffle. (Not sure technically what the name for it is.) My fabric is silk jersey I bought at Paron's in NYC last year. It feels wonderful, but shows EVERY bulge and bump underneath. I actually wanted to take this picture to show you, but with the flash, go figure--it doesn't show. Anyway, I've got to make some sort of slip to wear under this now. That silk jersey is like wearing nothing. I love this pattern! I've also made a top out of navy rayon jersey from it. A comfortable T-shirt, but so stylish and flattering. Here's another hot pattern from HotPatterns! 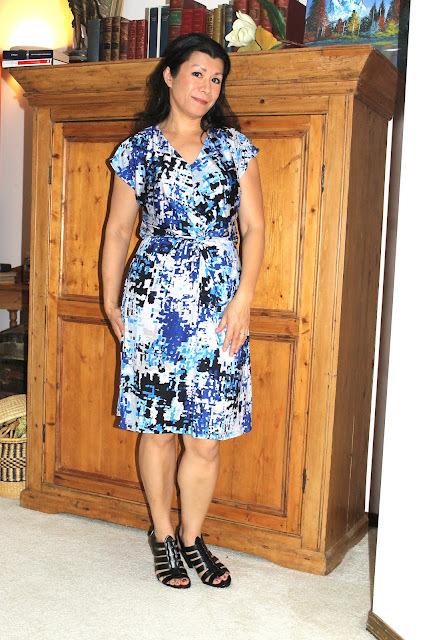 One of their newest patterns, the Verano Dress and Top. I made this top with printed rayon jersey I've had for a long time. Wore this to my daughter's homeschool graduation party. I think it's pretty cheerful, don't you? The pattern has a twist, right in the middle at the waistline. The only problem is it seems a bit square-ish. So I finally figured out how to alter all the HotPatterns patterns for myself. SBA! Small bust adjustment, and also taking out an inch off the center back. It's pretty consistent. I left the dress, in ITY fabric, a little long to wear to church. I cut a size 8 but after it was finished, I shaved the side seams in a bit. I think somehow the twist gets lost in the print, and also the fabric is so fine that it hardly looks bunched up where it's supposed to be. The pattern could be adjusted to include more fabric in the bunching part, for finer fabrics. The neckline seems like it could go a little lower (listen to me!? ), but for wearing to church, maybe it's just right. Oooh, these shoes are just wrong with the dress. Oh well, I don't really wear them anyway.